It is common for Japanese homeowners to plant in their gardens shrubs and trees which in winter bear fruit, berries or flowers. This is done to liven up the season in which most of the rest of the natural landscape turns dull brown and straw-colored- or in areas with months of snowfall- completely white. 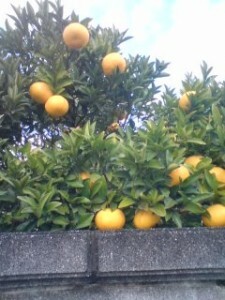 Walking around my own neighborhood in Tsukuba City in winter, I can see on the grounds of the older, traditional style houses, an adundance of citrus trees heavy-laden with bright fruit- different varieties of MIKAN (orange) or YUZU (citron). There are also the sazanka trees with their many pink or white blossoms ( and later in winter will come the similar camelia, TSUBAKI). Even more common, are the various shrubs which bear berries in winter. These can be seen growing around even the newer residences with the much smaller gardens. The more popular of these are nandian (NANTEN) , MANRYO,SENRYO, and PIRAKANSA, with their red-berries. Then there are the beautiful MURASAKI SHIKIBU and KO MURASAKI, whose berries are purple. 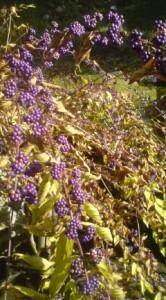 As I have already said, these berries help add lots of cheerful color to Japanese residential neighborhoods in winter. And as an added benefit, these bright reds and purples help to attract even more color and LIFE to wintery gardens. Though not usually eaten by humans, these berries are an important food source for many bird species and thus, gardens with these shrubs attract lots of birds. 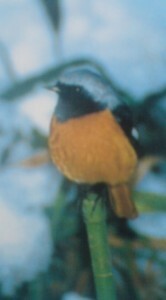 Probably the most colorful of the COMMON birds which are drawn to these berry bushes in urban and suburban gardens is the JOBITAKI (ジョウビタキ)- the Daurian Redstart. More specifically, the male of the species, which has an outstandingly rust-colored breast, a gray head, black face, and a distinctive white mark on its black wings. All this color packed is into a bird slightly smaller than a sparrow. The JOBITAKI really need those berries. You might be surprised to hear this since they are so small, but these birds are in Japan only for the winter. Each autumn they fly over from the continent ( SIBERIA and China), and then cross back to the other side of the Japan Sea to breed in spring. That is why it is always exciting when a JOBITAKI shows up in your garden in late October.When you see one, you know the little fella has been travelling hard over the past few days and is looking for a good piece of turf to claim as territory for the winter. A garden with plenty of berries does just fine. Even if you are not on the lookout for them, if a JOBITAKI has found your garden attractive it will let you know that it is there with its VOICE- marking out your territory as its own. The JOBITAKI have a few different calls, but the most distinctive is something like SQUEAK- CLACK-CLACK! This clacking sound, not unlike two flintstones being knocked together is in fact the origin of this birds Japanese name- BITAKI- which means fire starter. The JO, in front, probably means OLD MAN, a reference to it gray head. While in Japan over the winter, these birds live separately (as opposed to in pairs or groups), and guard their own territory quite fiercely. Besides fighting off the JOBITAKI next door, they can sometimes even be seen trying to fight off their own reflection in a window or car mirror. Hey,there he is! My JOBITAKI! In a leafless tree in the corner of my garden. Squeaking and clicking while it flits its tail up and down. A heart-warming sight and sound indeed, on a cold day like today! For the next couple of months I will be sure to spend time watching him. When march comes around he will set off over the mountains and cross the sea back to the continent. Its hard to image, but by summer this little bird picking berries in my yard might be on the shores of Lake Baikal in Siberia. Check Out the Blossoms on Japan`s Tea Trees (Camellia sinensis)- the Cha no Hana, which are in bloom now- though not popular among flower lovers in Japan- they just might be YOUR cup of tea! Jobitaki looks very cute birds both male and female. I have heard the name but never recognized any of them until reading Av-san’s article. Thanks. I am interested in the Japanese name Jyo-bitaki written with the Chinese characters 尉　翁鳥. ①i:official rank:少尉(syoui:second lieutenant),中尉（chuui:lieutenant）,大尉（taii:captain）in Japanese imperial army, originally 尉(i)was used official military rank in Chinese court and delivered to Japan during Nara period(around AD 7th century). ②jo:old man, especially played in 能(Noh).OKINA or OH. 翁鳥（hitaki or bitaki：fire stone）,I can not find exact Chinese letter, so first I made 翁in left part（okina:old man in ancient way of saying）,then put 鳥（tori:bird）in right part, this letter cannot be pronounced hitaki ,because its meaning as Chinese letter should be old-bird, I think the looks of male bird is an old man(grey head), so make 翁鳥（old bird）to be pronounced Bitaki as the bird was called so. 尉　翁鳥(Jo-bitaki) really means—- old-man-old-bird. ( meaning doubly). I am not a bird watcher; I only know very few birds, Crows, Sparrows, Pigeons, Hiyodori (bulbuls), Mukudori (larks), Sekirei (wagtails), Syujyukara, Onaga, Yakitori, Shakkintori etc. I would like to watch more birds around Tsukuba area and remember their names, twitters and shapes for pleasure during the rest of my pure humble life!! I used to be somehow popular among my friends for my special Karasu-Odori( Crow-Dance with song :Ka-ra-su naze nakuno, Karau wa Yamani kawaii nanatsuno kogaarukarayo・・・: Oh you crow! Why you are crying? Cause I have got very pretty seven chicks in the mountain, pretty! pretty! so I am crying. Please visit my old home in the mountain you can find my seven cute chicks.）. Once I played this dance at the unofficial farewell party for an agricultural attaché of the American Embassy in Tokyo. We had very close contact during beef trade negotiation talks. We were a little bit like Jobitakis who claim too much interests of each territory. Any way it was long time ago. Derailment! One of these cute females was in our garden today! We live in Sakoudo, Shiga-ken, Japan. Clack! clack! I wondered what was going on. Then I saw her on the top of a post near where we were digging. She stayed around for a long time and came within two metres of me. Pretty creature. I hope she comes back. We have a suzanka tree but no other berries. Maybe I should go and buy some of those worms!! I thought she was a “robin” when I first spotted her, but the song didn’t fit. Now I know why. A happy day. I can only hope she will visit us again before she takes off for the continent. Hello Ted-San! How are things out in Shiga? Thanks for writing! 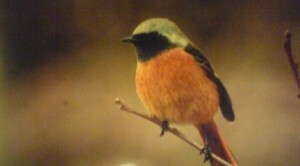 Its nice to hear from others who have enjoyed VISITATIONS from this charming bird. I hope she comes bask again. You can get the MEALWORMS (ミルワーム), the larvae of the チャイロコメゴミ虫,at a pet shop, or mash up some peanuts or walnuts and leave them out in the yard. You might also try birdcake which you make from a mixture of flour,sugar and margarine- you make them into little patties. JOBITAKI have been known to eat this ( though it will surely attract other birds who prefer this over most other offerings. Best of luck, best wishes, and hope to hear from you again! Thanks to Hiroshi Ogawa Sensei, a science teacher and expert on Tsukuba`s local flora and fauna, for sending in a beautiful photo he took this year of a JOBITAKI which he spotted perched nearby on his farm. I have added the pic to my post.